Aran (Occitan: [aˈɾan]; Catalan: [əˈɾan]; Spaingie: [aˈɾan]) (kent offeecially as Val d'Aran) is a admeenistrative entity in Catalonie, Spain, consistin o the Aran Valley, 620.47 square kilometres (239.56 sq mi) in aurie, in the Pyrenees muntains, in the northwastren pairt o the province o Lleida. This valley constitutes ane o anerly twa auries o contiguous Spain (an the anerly contiguous pairt o current Catalonie) that are locatit on the northren side o the Pyrenees. Hence, this valley hauds the anerly Catalan rivers tae flaw intae the Atlantic Ocean (for the same raison, the region is chairacterisit bi a Atlantic climate, insteid o a Mediterranean ane). The Garonne river flaws throu Aran frae its source on the Pla de Beret (Beret Flat) near the Port de la Bonaigua. It is jyned bi the Joèu river (frae the slopes o Aneto muntain) an passes unnergrund at the Forau de Aigualluts. It then reappears in the Val dera Artiga afore reachin the Aran valley, then throu Fraunce an eventually tae the Atlantic Ocean. The Noguera Pallaresa river, whase source is anerly a hunder meters frae that o the Garonne, flaws the opposite wey towards the Mediterranean Sea. Aran borders Fraunce on the north, the Spaingie Autonomous Commonty o Aragon tae the wast an the Catalan comarques o Alta Ribagorça tae the sooth an Pallars Sobirà tae the east. The caipital o the comarca is Vielha e Mijaran, wi 5,474 inhabitants (2014). The entire population o the valley is aboot 9,991 (2014). As o 2001, maist fowk in Aran spoke Spaingie (38.78%) as their native leid, follaeed bi Aranese (34.19%), then Catalan (19.45%) wi 7.56% haein a different native leid. Speakers o leids ither than the local Aranese are teepically fowk born ootside the valley, or their childer. In 1313, James II o Aragon grantit admeenistrative an poleetical autonomy tae the Aran Valley, the legal details o which are describit in a Laitin manuscript cried the Querimonia. The devolution o pouer wis a rewaird for the Aranese pledgin allegiance tae James II in a dispute wi the kinricks o Fraunce an Mallorca ower control o the valley. On 19 October 1944, Communist Pairty guerrillas invadit the valley in an attempt tae bring aboot the faw o the Spaingie dictatorship. They teuk control o several veelages till 27 October 1944, but wur forcit tae retreat back intae Fraunce efter Franco sent reinforcements to defend Vielha. Afore the construction o the Vielha tunnel, opened in 1948, the Aran valley haed nae direct communication wi the sooth side o the muntains durin winter. Aranese is the staundartisit fuirm o the local Gascon variety o the Occitan leid. Aranese haes been regularly taucht at schuil syne 1984. Like several ither minority leids in Europe that recently facit decline, Aranese is experiencin a renaissance. The name Aran comes frae Basque haran, meanin valley. Maps an road signs in Spain uise the name "era Val d'Aran" tae refer tae the valley, whaur era is the Aranese singular feminine airticle. The same practice goes for aw touns an ither locations in Aran, for example, the Aranese spellin Vielha is uised insteid o Catalan an Spaingie Viella tae refer tae the caipital o Aran. Basque toponyms reveal that Basque wis spoken further east alang the Pyrenees than the day. The growin influence o Laitin began tae drive Basque oot efter the turn o the first millennium. Admeenistratively, Aran is a "unique territorial entity" roughly equivalent tae a comarca wi addeetional pouers, an informally referred tae as a comarca. This status wis maist recently formalisit in Februar 2015. The aurie is dividit intae sax admeenistrative diveesions cried terçons (oc) (meanin "thirds", as thare wur formerly three diveesions). The current arrangement o the diveesions dates frae the 15t century. Syne 1991, Aran haes a autonomous govrenment cried the Conselh Generau (Occitan: General Council). 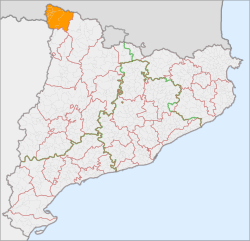 The major poleetical pairties are the Unity o Aran - Aranese Naitionalist Pairty (the local chapter o the Socialists' Pairty o Catalonie), the Aranese Democratic Convergence (the local chapter o the (Democratic Convergence o Catalonie). The Occitan Republican Left party wis foondit in 2008. The main economic activity in the valley is tourism; frae the ski resorts in the winter an frae ither tourist activity in the simmer. Ither primary sectors o the economy include forest products, cattle ranchin an agricultur, aw o which hae become progressively less important syne the openin o ski resorts. ↑ The ither contiguous aurie is Luzaide/Valcarlos, in Navarre, an aw locatit on the northren side o the Pyrenees. ↑ "Cens lingüístic de l'aranès de 2001" (PDF). Retrieved 2012-08-06. ↑ "LLEI 1/2015, del 5 de febrer, del règim especial d'Aran" (PDF) (in Catalan). Generalitat o Catalonie. 2015-02-13. Retrieved 2015-11-19. ↑ 7.0 7.1 "El municipi en xifres". Institut d'Estadística de Catalunya. Retrieved 2015-05-25. Smith, Dominic. "Language planning in the Val d’Aran: The recent work of the Conselh Generau d’Aran’s ‘Oficina de Foment e Ensenhament der Aranés’ and its effects on the Aranés-speaking population." (PDF). 2003. This page wis last eeditit on 11 Mairch 2018, at 18:55.